Nicolas Cage has made some questionable, even awful, choices of films to star in of recent years, but Knowing isn’t one of them. It’s an intelligent, well-constructed science fiction thriller that keeps you on the edge of your seat throughout, not on the basis of engaging special effect sequences, although there are those, but due to a thought-provoking premise whose explanation and resolution is doled out masterfully by director Alex Proyas (Dark City, I Robot). The film begins with an intriguing sequence at a public school in 1959 where all the children are asked to contribute a picture showing their idea of what the future will look like for a time capsule to be opened in 50 years. One little girl, Lucinda (Lara Robinson), instead writes down a collection of numbers which are duly included in the capsule, but she then disappears only to be discovered in a storage closet at the school where she has scratched more numbers onto the back of the closet door. Jump forward 50 years and we are introduced to John Koestler (Nicolas Cage), an M.I.T. astrophysicist and single father whose young son is a student at the same public school at the time of the time capsule’s opening. Each of the latter-day students receive one of the capsule contributions from the 1959 class and Koestler’s son, Caleb (Chandler Canterbury), gets the number sequence. When Koestler examines it, he discovers that rather than being random, the numbers have a predictive capability that may give him a terrifying knowledge of Earth’s future. Struggling to come to grips with this knowledge and also becoming aware that his own son is somehow directly involved, Koestler allies himself with the adult daughter (Rose Byrne) and grand-daughter (Robinson again) of the now-deceased writer of the original sheet of numbers. Apocalyptic themes are given a bad name by films like Independence Day, The Day After Tomorrow, and Armageddon (guilty pleasures though some of them may be), but don’t allow that to let you pass Knowing by. Its approach is that of any superior science fiction story – that of altering one or more variables in the world we know and asking what-if, all told in the context of the lives of ordinary human beings. Rooted in the question of whether the universe is pre-ordained or subject to random events, the story is doled out at first slowly by director Proyas, but with an increasing momentum that holds one’s interest throughout the two-hour running time. In a science fiction context, the ending is very appropriate, offering hope but not without a sense of loss and a degree of ambiguity. While Nicolas Cage has made a good choice of film for a change, his attachment to Knowing is not all positive. His portrayal of Koestler is mostly realistic, but his wide-eyed reactions are at times overdone, and one in which he sinks to his knees with arms spread wide apart in awe is particularly grating. It must be said that some of the dialogue he’s provided is not particularly helpful, however (How many times must we be subjected to the trite “O my god” as a reaction to something striking?). Fortunately, the support he gets from Rose Bryne, Chandler Canterbury, and Lara Robinson is an effective counter-balance. Look also for Ben Mendelsohn (Rogue One) in a supporting role and a young Liam Hemsworth in his first film appearance. 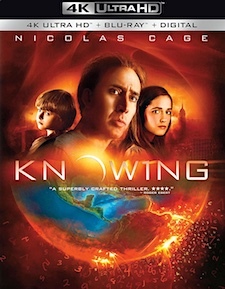 Knowing was shot digitally in the Redcode RAW codec (at 4K resolution) using Red One cameras and finished as a 2K Digital Intermediate. That source has been upsampled, given HDR10 and Dolby Vision high dynamic range color grades, and is presented here at the 2.35:1 theatrical aspect ratio. Image detail and texturing are very good, though not quite as good as you’d expect from a native 4K DI (though the fact that the image was captured in full 4K does help). But the color and contrast are the real star here. This presentation has truly deep blacks. Early on, there’s a shot of the Earth from orbit (about 7 minutes into the film) that really dazzles. The brightest areas of the frame are bright enough to be eye-reactive without being blown out, yet the shadows still reveal subtle detail. The colors are incredibly bold and vibrant, exhibiting noticeably more nuance and accuracy that is apparent in standard HD. After the shot of Earth, you’re shown a series of shots moving ever closer to the surface, centered on the northeast United States at night – just watch as you see tiny flashes of lights, cars moving on highways, and the like. It’s a gorgeous image, grain-free yet cinematic, and an HDR stunner. The audio is even better. The film has been given in a new Dolby Atmos (7.1 TrueHD compatible) mix that’s muscular and impressive, with exceptional clarity, smooth and natural panning, and incredible LFE. The soundstage is expansive and immersive at once, with plenty of subtle ambience and directional cues coming from seemingly every direction. The height channels are used to lift and complete the soundscape vertically, and really kick in during the set-piece scenes, particularly during plane crash and the film’s climax. Worth remarking on is Marco Beltrami’s score which is at times entrancingly mysterious and at others drivingly intense. It’s delivered with impressive fidelity at all times. This is a reference quality audio experience. Additional audio options on the 4K disc include French and Spanish 5.1 Dolby Digital. You also have optional subtitles in English SDH and Spanish. It’s not a lot of material, but the longer featurettes are interesting and worth your time, and the commentary is good and informative. Interestingly, the 5 Things Worth Knowing piece is new to the 4K disc – it’s not on Blu-ray. You also do get the Blu-ray version, which is the same as the previously-released disc (including the film in 1080p HD), and an UltraViolet digital code on a paper insert. It’s always a delight to find an intelligent thriller like Knowing. This one has a science fiction context that adds considerable interest and thoughtfulness. It’s also good to know that Nicolas Cage’s judgment of material hasn’t been irreparably damaged. Both the film and this 4K Ultra HD release are highly recommended.